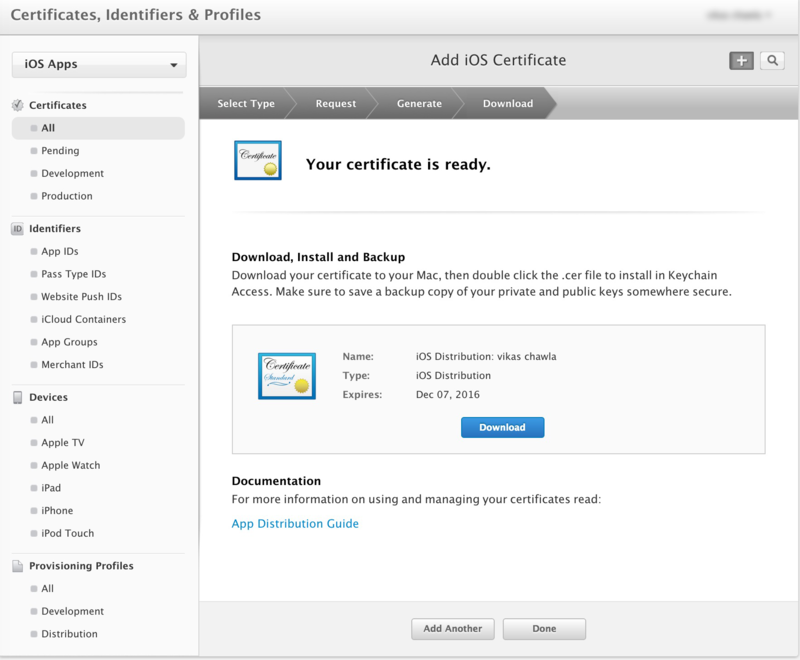 You need to create iOS Distribution Certificate to be able to upload apps on app store. 1. Go to Apple Developer website (http://developer.apple.com/) and Sign in to your Apple Developer Account by clicking the member center in the menu bar. 2. Click on Certificates, Identifiers & Profiles. 3. On the left hand side click on Certificates > All. 4. Click on the plus icon at the top right to add a new Certificate. Select App Store and Ad Hoc under Production. Click Continue. 5. 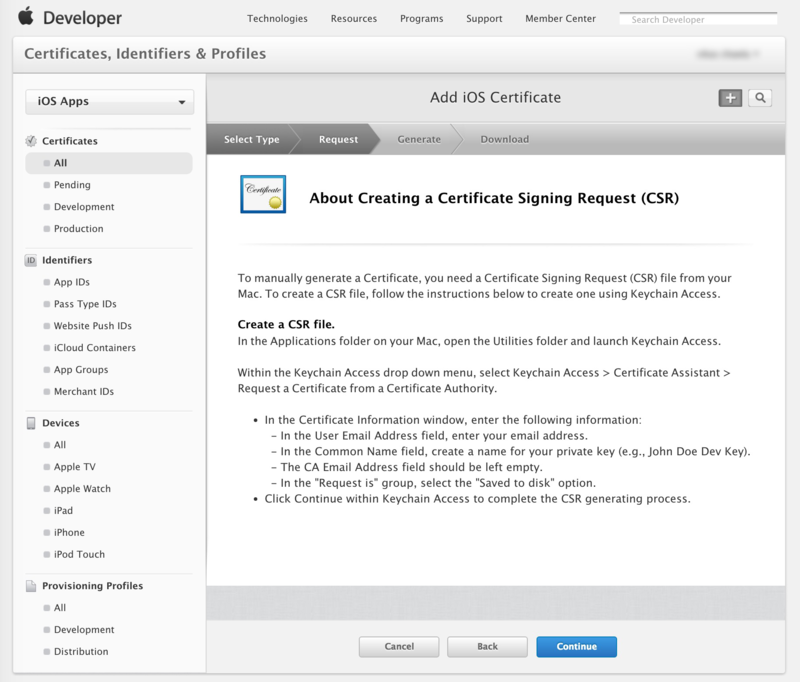 Now you need to generate a Certificate Signing Request (CSR) using Keychain and next screen will tell you the required steps. 6. 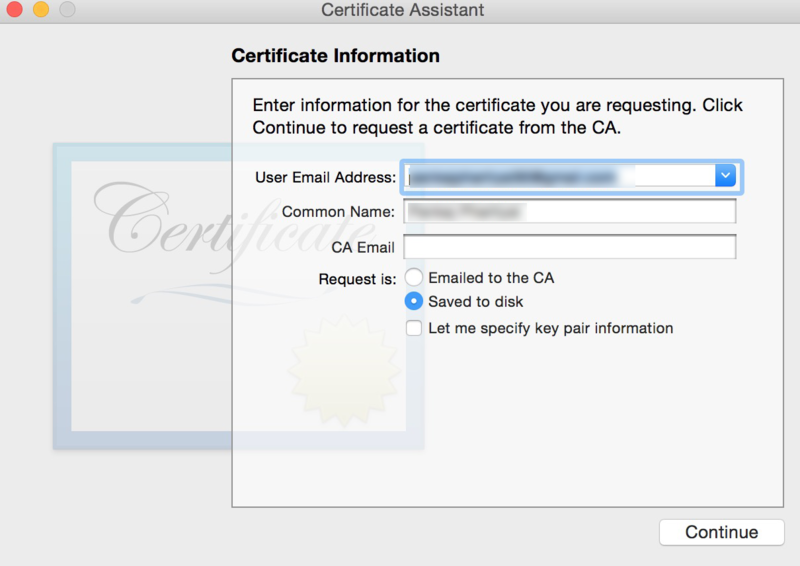 According to it you need to open Keychain Access App in you mac device and then select Keychain Access > Certificate Assistant > Request a Certificate From a Certificate Authority. 7. It will ask you for your email address (used to sing for Apple Developer Account) and Name. Leave CA Email field blank and select Saved to disk. Click continue. 8. Next it will ask for a location to save the file. Save it at any location. Now resuming from step 5, click continue and it will ask to upload the file you generated just now. Upload the file and click Generate. 9. Make sure you have Xcode open. 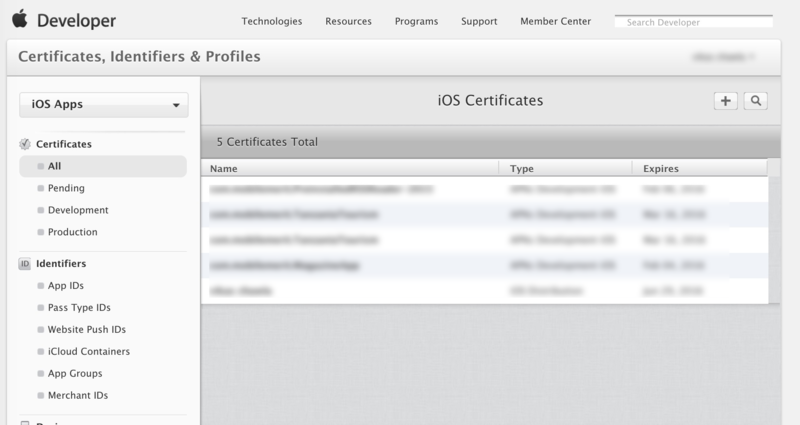 In the next screen download the Distribution Certificate and double click it to load it in Xcode. 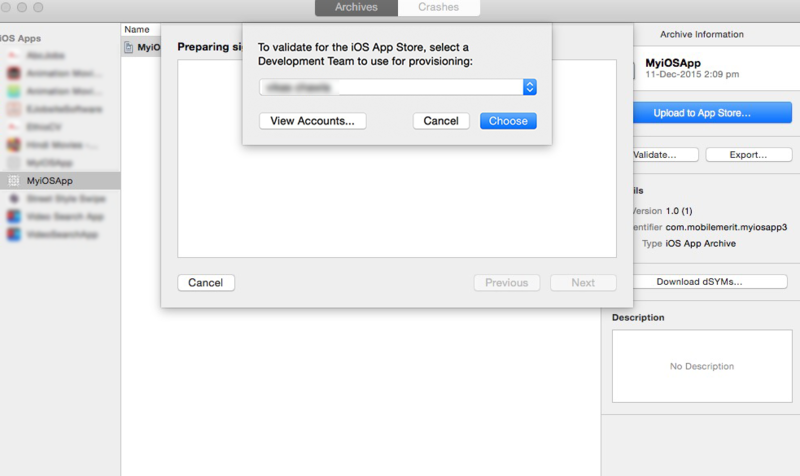 Actually nothing happens when you double click the certificate file but it will be loaded into Xcode. App ID uniquely identifies your app in App Store. It is generally written in reverse domain notation. e.g. if your app name is My iOS App and company URL is abccorp.com then your bundle identifier can be com.abccorp.my-ios-app. 1. Bundle Identifier can be found in Xcode. Open your project and in Navigator Area click the project name at the top. 2. On the right the project settings will open. Click the app name under TARGETS. 3. Make sure the selected tab is General at the top. 4. Now under Identity panel you will see Bundle Identifier. 2. 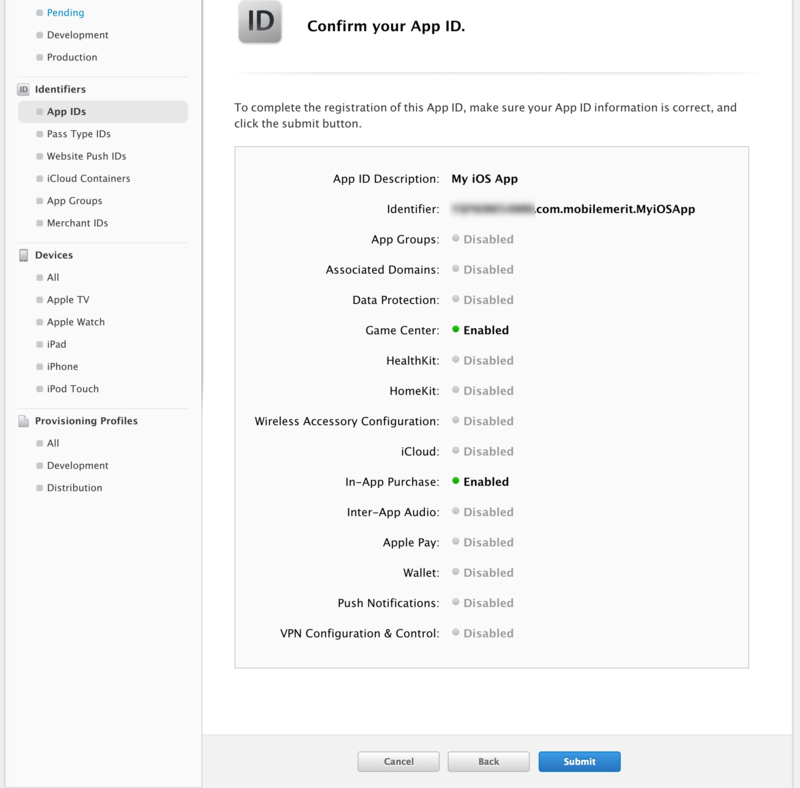 Now you have to create App ID in Developer center. 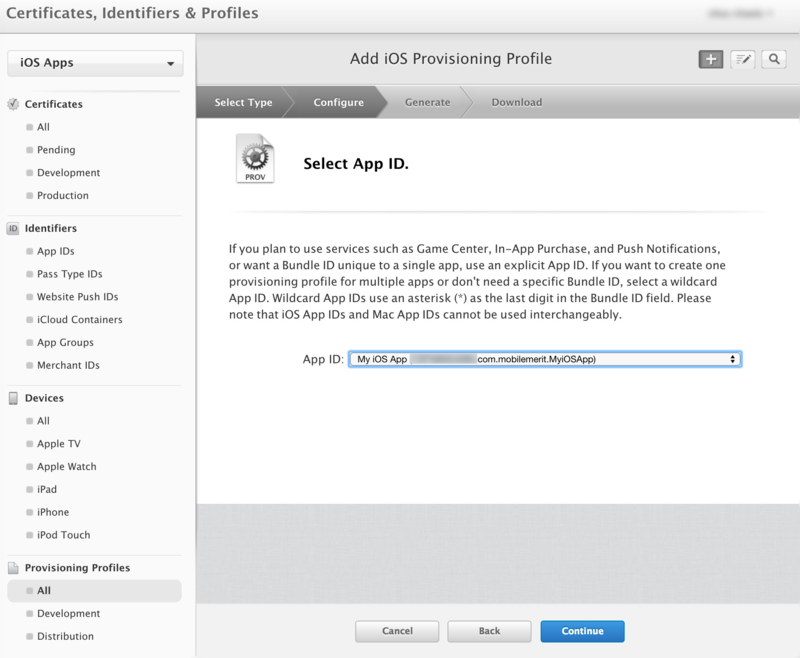 Login to Developer center and click Certificates, identifiers and Profiles. Now On the left column under Identifiers click App IDs. It will list all your App IDs on the right. 3. Click the plus icon on top right to add an App ID. It will ask for name and bundle identifier. 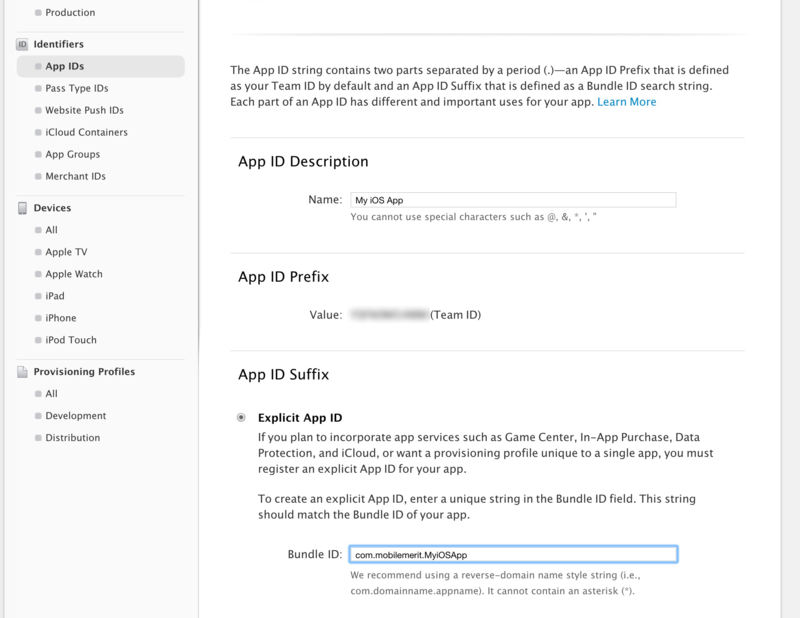 Type any name (preferably name of your app) and bundle identifier from Step 1. The Bundle Identifier should be exactly same here. Take care if you have put additional spaces etc. Click continue to go to next step. 4. Verify information and press Submit to add the App ID. 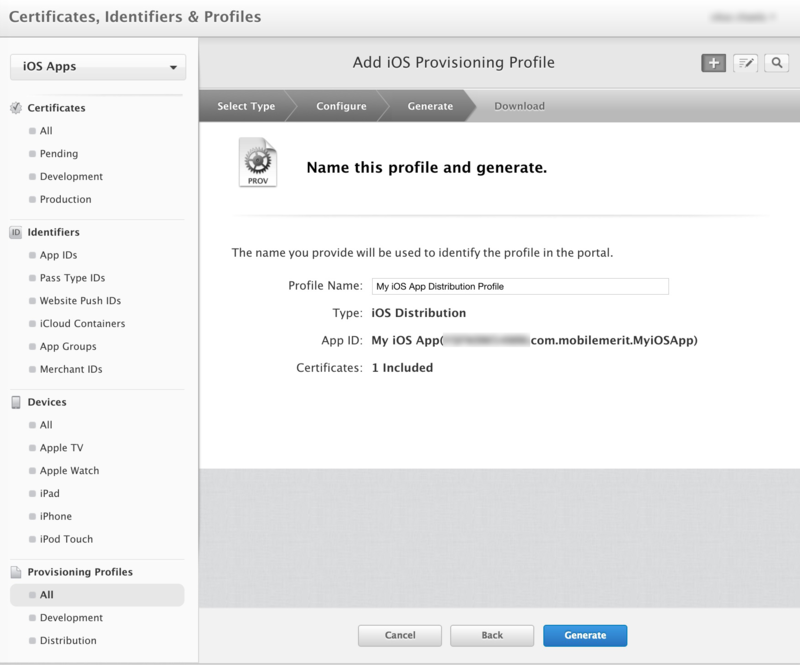 You have to create a distribution provisioning profile to distribute an app on App Store. For this you need App ID and a distribution certificate so create this after creating both. 1. 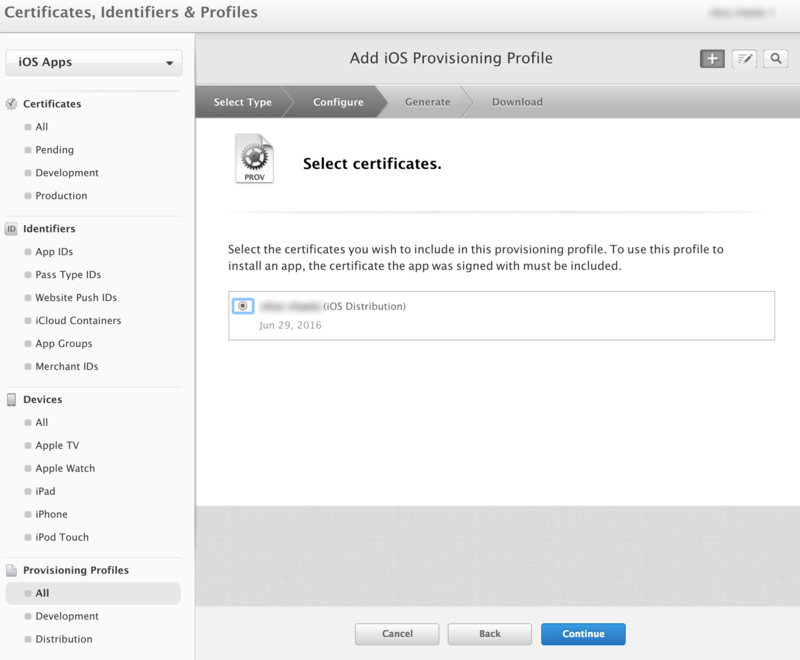 Login to Developer center and click Certificates, identifiers and Profiles. 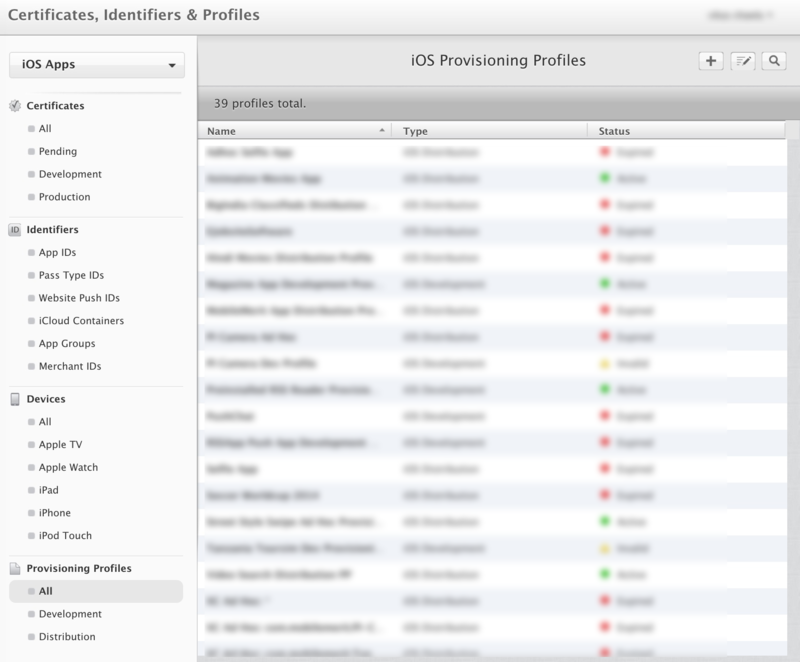 Now on the left column under Provisioning Profiles click All. It will list all your Provisioning Profiles on the right. 2. 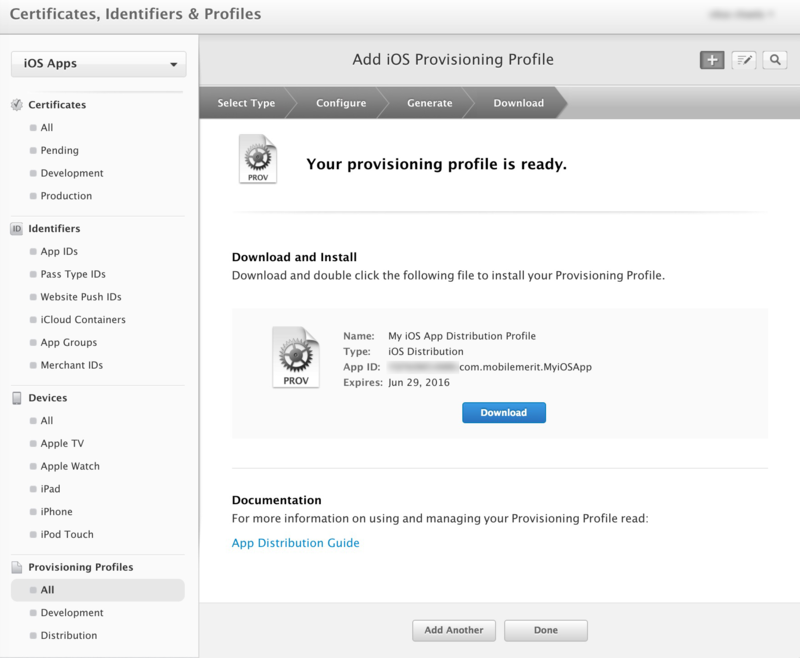 Again click the plus icon at the top right to create a new provisioning profile. 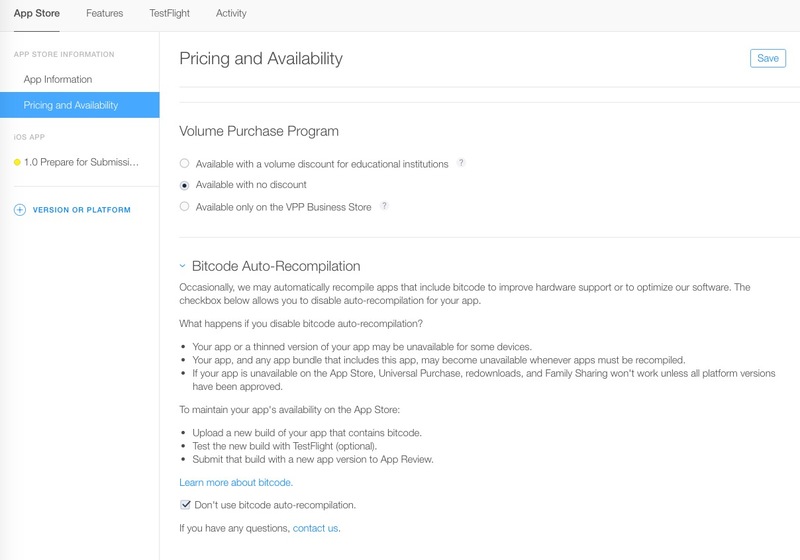 Check the App Store option under Distribution heading. Click continue. 3. It will ask you to select the App ID for your app. Do that and click continue. 4. Now select the distribution certificate you created earlier and click continue. 5. 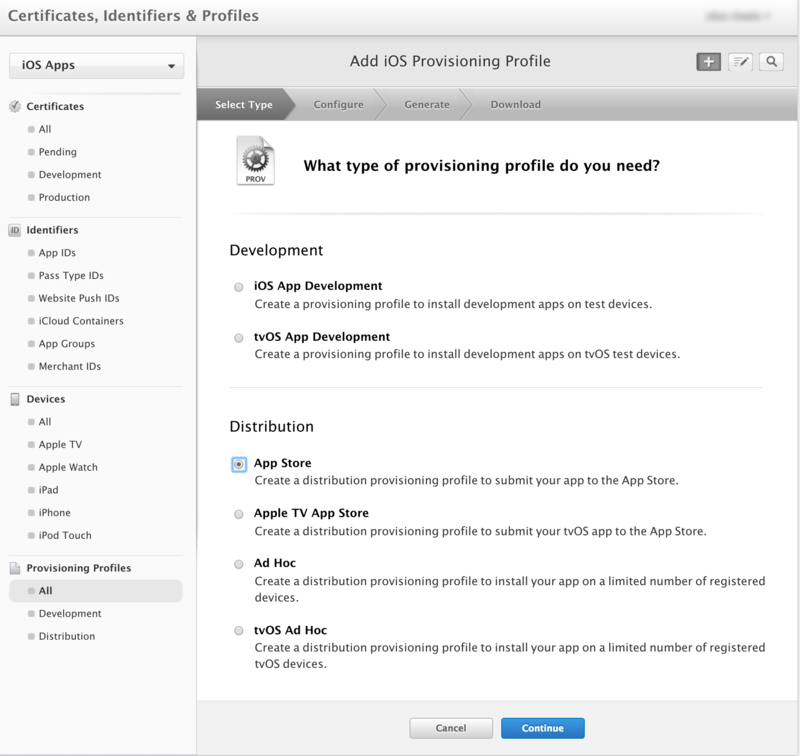 Next name the provisioning profile (add the app name in it so that you can easily locate later in Xcode) and click Generate. 6. 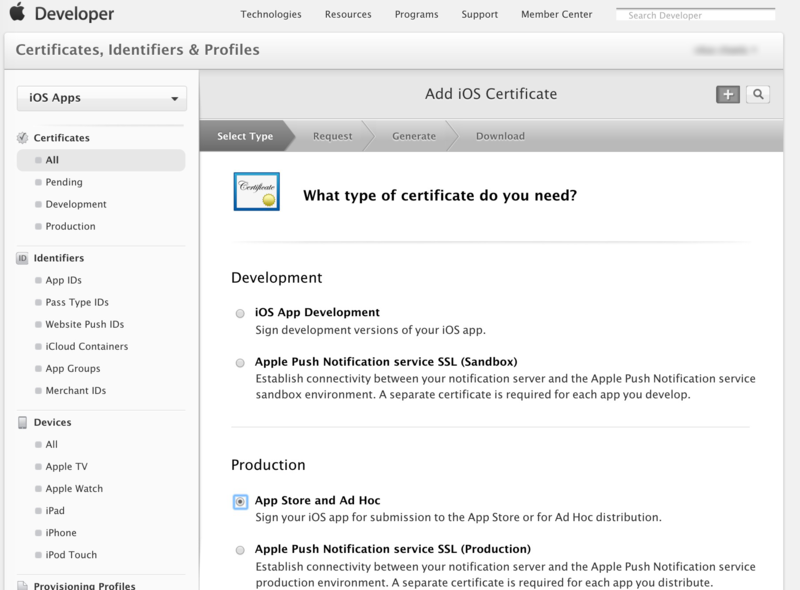 In next step download the Certificate and double click to load it into Xcode. Xcode must be open before you open this file. 7. Load your project in Xcode. Click the project root in Navigator area (Fig 19-1). Select the App target (Fig 19-2). Click general tab (Fig 19-3). Select the team from Team dropdown (Fig 19-4). Every developer account have a default team with same name as the Account Developer name. You must be able to view that team name in this dropdown. 8. 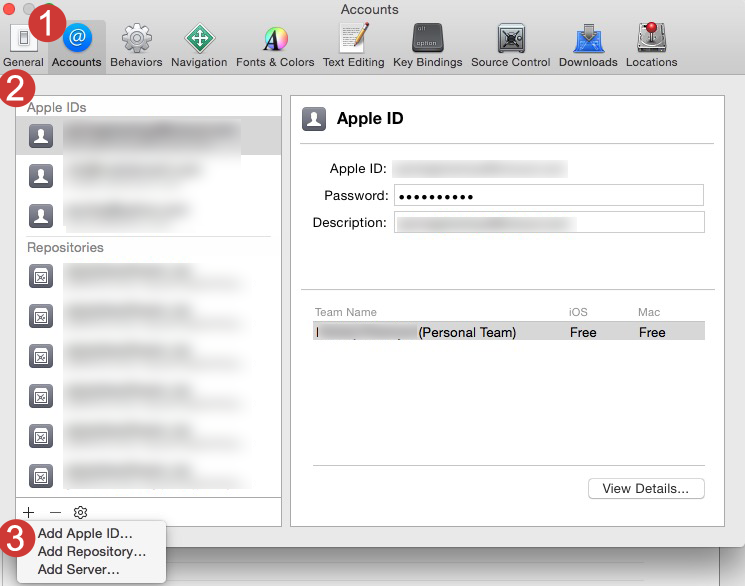 In case no team is listed you have to add your developer account in Xcode. It can be done by going to Xcode > Preferences. Xcode preferences will open in a dialog (Fig 20). Click the accounts tab (Fig 20-1). 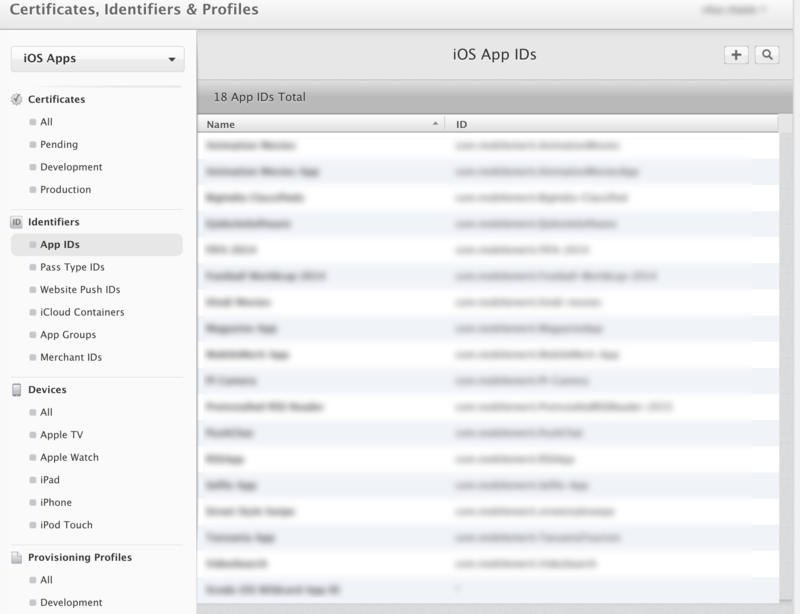 See if your Apple Developer ID is listed in Apple IDs panel on left (Fig 20-2). if its not there then click plus button on bottom left (Fig 20-3) and select Add Apple ID.… Restart Xcode if needed. Now in Step 7 your team will be listed in Team dropdown. 9. Now is the time to connect the app to its Provisioning Profile which we created earlier. Again under Build Settings tab (Fig 21-3) type provisioning profile (Fig 21-4) and you will get Provisional profile dropdown (Fig 21-5). Click the dropdown to select the provisioning profile you generated earlier. 10. One last caveat. If you’re familiar with bitcode optimisation then go for it else you have to disable it. To disable it go to Build Settings (Fig 22-3) and search for bitcode (Fig 22-4). Change the Enable Bitcode field to No (Fig 22-5). C. Create new App in iTunesConnect. 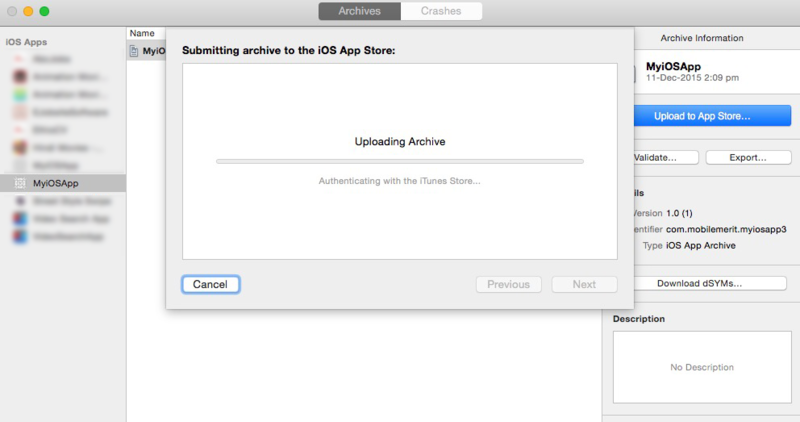 Before submitting the App you must create an App entry in iTunesConnect. 1. Login to iTunesConnect account (itunesconnect.apple.com) using your developer account credentials. Click My Apps. It will list all your apps. 2. Add a new app by clicking the plus icon (+) at top left and choosing New App from the dropdown menu. 3. A dialog box will appear and it will ask you details about your app and click Create. 1. The name field must be unique. You can use a descriptive name with keywords. 2. 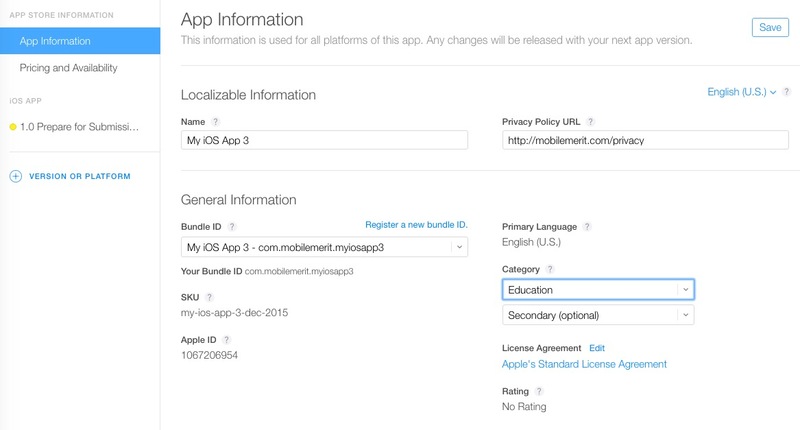 Bundle ID will show a dropdown with all App IDs you can use to create this app. Choose the correct one you create earlier. 3. 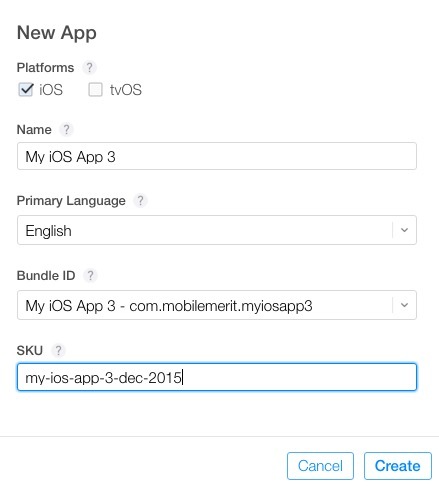 SKU is also a unique identifier for your app which is not visible on App Store. 4. Fill all mandatory fields in App Information and hit Save button on top right. 5. 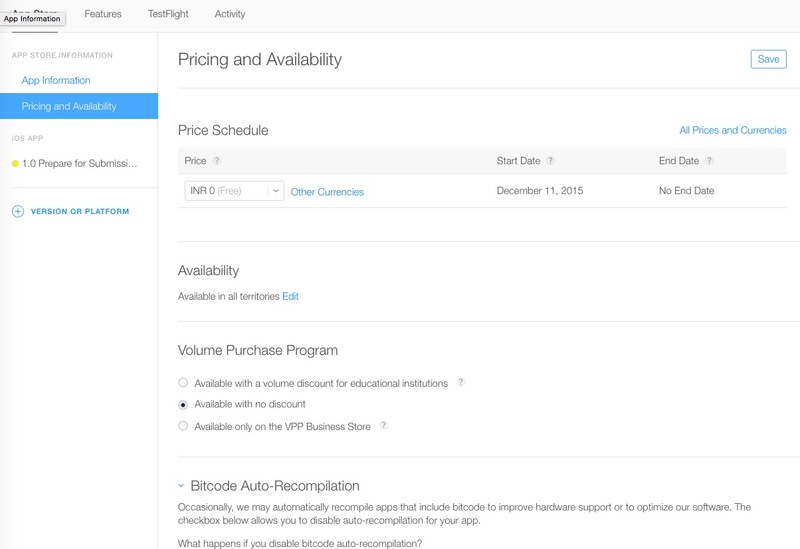 The fill the Pricing and Availability on the left column and again fill all mandatory fields. 6. In the same step check the Bitcode Auto-Recompilation options. If you don’t have it check Don’t use bitcode auto-recompilation. Hit Save. 7. Now click Prepare for submission option on the left column. Here you upload App Screenshots, Description, Keywords, App Binary etc. Fill all required fields and hit save. You will be able to submit app only if all mandatory fields are filled properly. Also you need special instruction to upload a binary to this app which we will discuss separately. Be sure to read the Apple Guidelines on App Icon, App meta data and App screenshots. You can also upload App video here. 1. 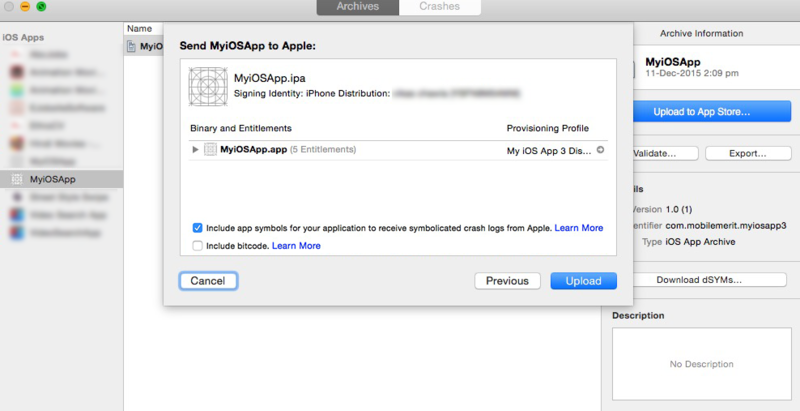 Open your app in Xcode. Connect any compatible device and select that device in Scheme Menu in Xcode (Fig 29-1). 2. Select Product > Clean. Then Product > Build. Then Product > Archive. When archive command is completed the it will open Organiser window. Organiser window can also be opened from Window > Organiser. Organiser window will show your archived app on left side and all of its versions in main middle panel. Click Upload to App Store button on the right column. 3. It will ask to select the account (Fig 31). 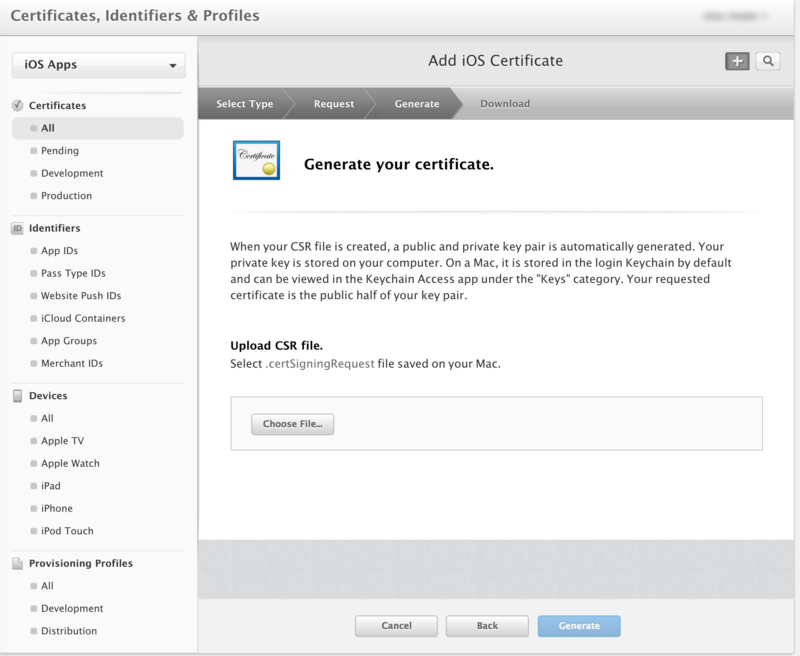 After that it will verify all certificates and iTunes App ID and if all is good then you will see a dialog with upload option (Fig 32). Uncheck Enable Bitcode option if you’re not using BitCode optimisation (Fig 32). Click Upload button and it will start to upload (Fig 33). It may take anywhere between 15 mins to 1 hour depending upon size of your app. Please be patient. 4. When your upload is complete then you can view your binary under Activity tab. 5. If it says processing then wait for some time until the text (Processing) goes away. 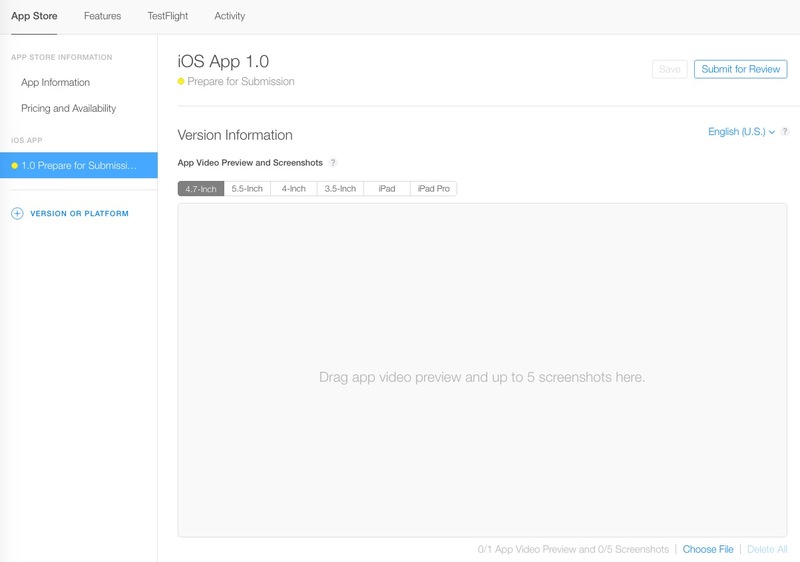 The you’ll be able to add a build in App Store tab under Prepare for Submission. Fig 35. You’ll now see a plus icon after Build title clicking which will open a modal listing all the valid builds uploaded via Xcode. Fig 35. Select appropriate build and press Done and it will be added to builds. 6. Now you can press the Submit for Review button to submit the app to App Store. Lastly it will ask about encryption and ads. Fig 36 & 37. Answer them and click Submit at top right. 7. After this App Status is Waiting for Review. During this period your app will be in queue waiting to get reviewed from Apple Engineers. It may take upto one week to get the feedback on App.